2014 racing starts off great for MR2’s! 2014 has started off awesome for MR2s in endurance racing. December 2013 saw Racing Strong finishing 3rd in the ice bowl championship on the Patriot Course at VIR in Virginia. 10 hours of racing in the ice and rain was incredibly fun with our yellow 3MZ v6 powered MR2. So to start 2014 we headed to Road Atlanta in late February along with Team Biohazard MR2 owned by Troy Truglio to race for 14 hours. 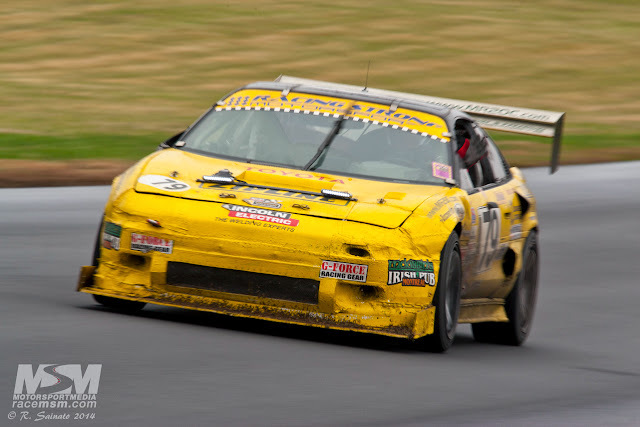 We started out pretty good getting into 5nd, and then fell back to 88th place when Racing Strong driver and 2013 Ohio SCCA Driver of the Year (MK1 MR2 D-Production) Mike Helm lost the right front tie rod on the 1991 MR2 braking into turn 10A. He made it back into the pits where we set out to fix it. Found out the tie rod was frozen on the rack side. So when I would align the wheels it basically unscrewed itself. Lesson learned. We got the car back out on the track in about 19 minutes after reinstalling the rod, and doing a quick alignment. All the time this is happening Troy and his team in the 3MZ V6 powered Biohazard MR2 take the race lead. We battle back and get back into the low 30s, but at the 12 hour mark I get a radio call that the car broke. Gene says he thinks the transaxle let go. Tow truck gets back to the pit and we immediately see that the tire is no longer connected to the car, it is sitting up in the wheel well. The Timken Camry hub broke in two at the flange, and then the axle tip broke from the stress. Troy and his team ends up winning the first race of 2014 in his badass winged 91 V6 MR2. We load up and head home to figure out why the axle broke. After a few emails to different people, Timkin emails me and basically says that the Camry hub broke due to stress that it was not designed to take. So I picked some 1998 turbo uprights with hubs off a MR2OC member and installed those. So we head down to Virginia International Raceway near Danville, Virginia for the ChumpCar 12-hour endurance race. I have Gene Bird owner of Zipline Welding Booms and Mike Helm driving for me. Troy is there with his MR2. He has a new driver, and he is also testing out a few new things. We start the race pretty well in 8th and work our way into the top 5. A few times we take the lead. I am really concentrating on learning and trying out new “race craft”, trying to time pit stops and getting our pit stops done so we spend no more than 5-minutes total in the pit. We have minimum 5-minute pit stop rules. Safety thing. So I have my 13-year old son Ian sitting on the stopwatch letting us know exactly how we are doing as we fuel and swap drivers and cool suit ice. It is working great. Troy has some issues, one of his drivers hits something and the left front strut breaks. He also had some ECU issues that were fixed with a quick ECU swap. But he was basically out of contention early. But he was still fast as hell when he was out there. On the second to last stint Gene takes over and is doing well. He is in 2nd and a big rain comes. The third place car is an Acura Legend V6 and he is very close to catching us.I was pulling faster laps than Gene, so we made a decision to pull him in 20 minutes early when a local yellow popped up. I hopped in, we added 15 gallons of high test fuel, and I headed out on a wet track. Really really NOT fun in the MR2! I kept us in 2nd until the 3rd place car passed me. I had a very big issue with third gear. It worked sometimes. Under hard braking it may be there, or it may not. And third is a very important gear on the South Course! Troy was coaching me over the radio letting me know where the Acura was.When he passed me, I basically gave up. Save the car and settle for 3rd and a podium. He basically called out my manhood at that moment. I agreed, balls out. 1st or last. That is why we race. I caught back up to the Acura and we both came up on slower traffic. I am really good in traffic. I was able to get past him and boxed him and then sneak in between two cars on Oak Tree leaving him stuck behind me. I then put down the fastest lap I have ever down on VIR South. 01:25.976. What is wild is that I did that in traffic! We ended up finishing 2nd overall. My best finish racing this yellow V6 powered MR2 over the past 3 years. Great video of the Acura chasing me down at the end of the race. Acura chasing down the Yellow 79. Inside the V6 MR2 with Mike Helm driving. Mike set our fastest lap at 01:25.157. Racing with Mike Helm in the Yellow 79. Our next race is at Watkins Glen May 23 – 25 for three races, 6 hour, 12-hour and a 6-hour. We are bringing spare engines! lol. Come join us if you want to see some great racing!